Are there new ways to look at how government formulates budget — including making them more transparent? We’ll break them down with Matthew Hall from Open Plans. The GSA conference spending scandal has put training in jeopardy. So how do you train your people and still come in under budget. Advice from Steve Ressler the Founder of GovLoop. Air and Space Museum this morning — landing at Washington’s Dulles International Airport and the Smithsonian Air and Space Museum’s Udvar-Hazy Center. 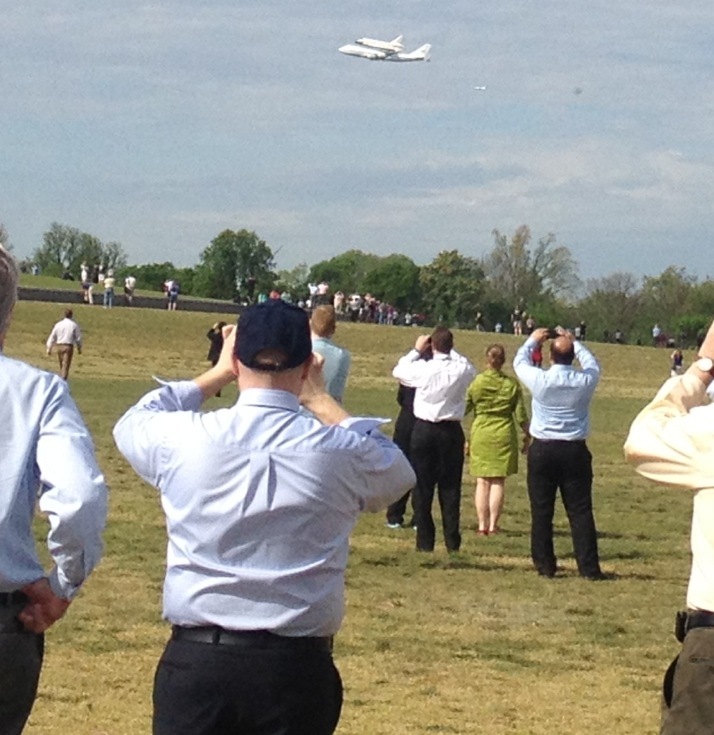 But before it landed the shuttle made a swing past the National Mall. Here is some footage from our own GovLoop team! Former GSA Administrator Martha Johnson has apologized for the lavish spending at the 2010 Western Regions Conference. Johnson told House lawmakers at a hearing on Capitol Hill that she regrets rewarding conference organizer Jeffrey Neely with a bonus. The Wall Street Journal says Neely who was also at the hearing declined to make a statement citing his fifth amendment rights. The Defense Department says there might be more military personnel involved in misconduct before President Obama’s trip to Colombia. 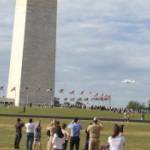 Five additional Defense Department employees were seen on a video carousing with the 11 secret service agents at the center of the probe. The Washington Post says 11 Secret Service agents have already been placed on leave amid allegations they entertained prostitutes, potentially one of the most serious lapses at the organization in years. The time it takes to retire is dwindling. The Office of Personnel Management has put in extra effort to fix its long-standing pension processing backlog. OPM says they owe their success to process improvements. Federal Times says OPM’s Director John Berry outlined the new strategy last January that called for a combination of increased staffing, streamlined processes, improved information technology and better cooperation with other agencies. So far this year the agency has reduced the backlog by more than 14%. The Justice Department has known for years that flawed forensic work might have led to the convictions of potentially innocent people nationwide. But the Washington Post says prosecutors failed to notify defendants or their attorneys even in many cases they knew were troubled. The DOJ started reviewing cases in the 1990s after reports of sloppy work by examiners at the FBI lab. But the officials only reviewed a small portion of the cases. The Justice Department claims they’ve met their legal and constitutional obligations when they learned of specific errors, that they alerted prosecutors and were not required to inform defendants directly. The GSA is boosting its mileage reimbursement rate. Now federal commuters who use their own cars to drive to work can expense an additional 4.5 cents per mile. GovExec says the new law takes effect today. Reported military sexual assaults are on the rise. Government Executive says the Defense Department saw a total of 3,192 reported incidents, a 1 percent increase over fiscal 2010. In the last year the DoD has implemented new policies designed to combat sexual assaults, including expanded legal assistance and expedited transfers for victims, as well as a longer retention of forensic evidence and investigative reports, according to the Defense report. DARPA is looking for more power-efficient computing systems. The Pentagon’s research arm says existing computer systems don’t process data quickly enough for military operations. Next Gov reports intelligence, surveillance and reconnaissance systems today have senSors that collect far more information than can be processed in real time. 03.28.2012 DorobekINSIDER: Frank’s career corner – the ‘who’ question; making diversity matter; are LinkedIn resumes honest? Happy Wednesday… And a glamorous night ahead… Federal Computer Week’s annual Fed 100 Awards Gala… Looking forward to seeing some of you there and honoring the winners… and then tomorrow, I’m moderating a panel at the Acquisition Excellence 2012 conference… we’re talking about what doing more with less means for acquisition. And we’ll bring you highlights here on the DorobekINSIDER. The lack of transportation bill: And we’ll go into more in the news, but… yes, there are only a few days for Congress to take action on the highway bill or it is highway Armageddon… well, that’s what The Washington Post calls it. The House again dodged efforts to move forward. Everybody keeps thinking that this will get resolved, right, because… well, really? Politico says that it is looking bleak. They say it looks eerily similar to previous struggles… we all remember the good times around the stalemate over government spending bills… or the showdown over increasing the borrowing cap… and, of course, the payroll tax holiday. We’ll see. There are only a few days left. Saturday is the big day. Supreme Court health care arguments: And we have to mention the continuing arguments about healthcare before the U.S. Supreme Court. Today is the third and final day. And if you have some time, it is well worth your time to listen to the arguments. These days, it is difficult to find really smart discussions and debates about real issues, the arguments before the Supreme Court meet those criteria. They are smart. Yesterday, the question was about the mandates: Can the federal government require citizens to buy a good or service. Today, the discussion is about severability: if the Court rules the mandate is unconstitutional, how much of the law can survive? Keyboard pants: And… You may know somebody with fancy pants. Well, what about keyboard pants. That’s right — they are jeans with a built-in keyboard… and they are designed for… maybe… public works crews, police, emergency responders and the military… they have a wireless rubber keyboard that is sewn into the midsection. 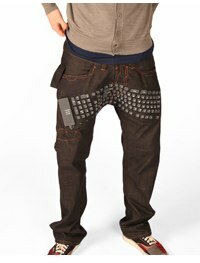 The idea comes from the Netherlands… They have a set of speakers, a wireless mouse and a keyboard… all integrated into the jeans… and they bring a whole new meaning to the phrase, Is that a keyboard in your pocket? Are you happy in your career? Yes — happy and career can go together. Frank DiGiammarino will walk us through the first step of the career framework. Diversity in the federal workforce — does it matter? or is it just another mandate? We’ll talk to Tom Fox of the Partnership for Public Service. And that traditional resume… and the one people put on, say, LinkedIn. Which is more accurate? We’ll talk to the person who has actually done research to determine the answer. And we go from talking about how benefits of being boring… Well, here is a reason to go online… You’ve probably heard of the Twitter feed… well, it is S my Dad Says… Yes, use your imagination. It is the Twitter feed that was a short-lived TV show. Well, now there is S that bureaucrats say… hat tip to GovLoop member Mike Kujawski… We have the link online… and my guess is this will go viral and be much discussed around government water coolers… and yes, it is safe for work. And yesterday we told you about the virtual worlds conference. And I heard some of you roll your eyes and say that this is just game playing. Today, we’ll talk about how these tools can actually be used — and, yes, how they can save you money. There is a new chief watchdog at the Recovery, Accountability and Transparency Board. It’s a visible job. She takes over from Earl Devaney. And she has a tough task leading an organization that could sunset is a little over a year. We’ll introduce you to Kathleen Tighe later in the program. You watch what you eat, but do you watch what you read? and watch? and listen to, for that matter? and click on? We’ll talk about OUR role in defining the meadia culture out there… we’re going to talk to Clay Johnson, author of the book The Information Diet. And have you seen the TV show Undercover Boss? We’ll talk to a professor about the advantages of walking in somebody else’s shoes. For the past several years, I have been hosting something I call the DorobekINSIDER Book Club — it is something like the Oprah Book Club but more wonky. Essentially, we select a book that is tied to my favorite words: It helps the government do its job better. We invite the author… and then we invite a fed — or feds — to talk about how that book impacts how you do your job. And, in fact, the books we have selected are usually chosen by government people themselves. 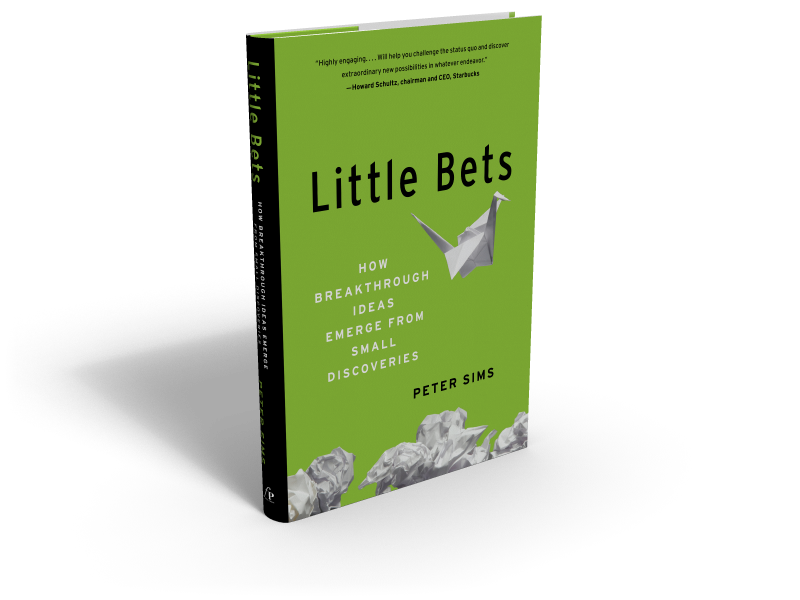 This week, we held the latest ‘meeting’ of the book club — the book is by Peter Sims — Little Bets: How Breakthrough Ideas Emerge from Small Discoveries. I used to hold the book club discussions on the radio. But now, we get to do them the way book clubs are supposed to be held: In person. I got to lead a discussion at the 2012 Adobe Government Assembly hosted by 1105 Media. And it was a great discussion. We had Peter Sims and we were joined by Dave McClure, the Associate Administrator of GSA’s Office of Citizen Services and Innovative Technologies, who is one of the brightest people I know. I mentioned earlier, “Little Bets” was recommended by Peter Levin, the chief technology officer at the Department of Veterans Affairs — an agency which has historically been bogged down in projects that were over budget and way beyond the schedule. And Levin has tried to institute “lay-ups” to get some momentum within the agency. Levin and VA CIO Roger Baker have made remarkable progress, by all accounts. The book club conversation is wide ranging — and we talk about challenges that agencies face. But we’d love to get your thoughts. We’ve created a page on GovLoop, and I hope you’ll add your thoughts and ideas about the conversation… and I hope you’ll read the book and suggest ideas for how to make little bets work within your agency or organization… what works… and what doesn’t? How do you make ‘little bets’ actually happen? The Office of Management and Budget has just issued a new policy for dealing with Internet “cookies” — these are text files that a Web site can put on your computer to track how you traverse the site. The federal government has been all but banned from using persistent Internet cookies because of those privacy concerns. OMB has just issued new policy guidance would enable agencies to use this tool. And Federal News Radio’s Max Cacas reported on the new policies on the Dorobek Insider on Friday. You can find his report here. This is an issue I’ve followed for a long time (here is the FCW editorial I wrote on the subject back in 2006) — and, to be honest, I’m suspicious of the new policy. That being said, I have just started reading them. The new OMB policy seeks to re-balance the privacy considerations given that the ban was instituted more than a decade ago. The idea: Times have changed and people are more accepting of these tools. I’m reading the new policies with an open mind, but… I’m very suspicious. Giving OMB credit, they tried to evolve these policies in a relatively public way. As I seem to say a lot these days, I think they could have developed it in a public way. That being said, it would be nice if the comments were still available. In June 2000, the OMB Director issued a memorandum (M-00-13, later updated by M-03-22) that prohibited Federal agencies from using certain web-tracking technologies, primarily persistent cookies, due to privacy concerns, unless the agency head approved of these technologies because of a compelling need. That was more than nine years ago. In the ensuing time, cookies have become a staple of most commercial websites with widespread public acceptance of their use. For example, every time you use a “shopping cart” at an online store, or have a website remember customized settings and preferences, cookies are being used. Read the full post — and the comments — here. * The Federal Register item that went along with that comment period. Last week, Vivek Kundra and Katie Stanton talked about the efforts underway to introduce more Web 2.0 technologies to the federal government sites and to open more back-and-forth communication between the American people and the government. Some of this naturally requires the adoption of new approaches and innovative technologies. But another big part of this is updating existing practices and how these tools can be used to break down barriers to communication and information. We continue to ask for your feedback, but the best feedback is informed feedback. So what follows is background on current policies and some examples of what we’ve heard from you during the Brainstorming phase of our outreach. Nine years ago – a lifetime in Internet time – the Office of Management and Budget (OMB) issued a policy commonly referred to as “the cookies policy. “This policy prohibited federal agencies from using certain web-tracking technologies, primarily persistent cookies, unless the agency head provided a waiver. This may sound like arcane, boring policy – but it is really important in the online world. Continue reading the full post here. Going back a decade… some of the discussion that led to the persistent cookie ban. [The CIO Council] strongly support the requirement that the use of any technology, including persistent cookies, to track the activities of users on web sites be approved personally by the head of the executive department (for the 14 executive departments) or agency. As we make progress towards electronic government, personalization of web sites, typically done through persistent cookies, may become necessary in order to serve our customer’s requirements. At that time, it would be appropriate for OMB to review the “no delegation” policy in light of the then-current “state-of-the-art” in privacy protections. For example, OMB may decide to relax this policy when customers are given a choice of selecting either a personalized (i.e., with persistent cookie) or non-personalized (no persistent cookie) web experience. We are concerned about persistent cookies even if they do not themselves contain personally identifiable information. Such cookies can often be linked to a person after the fact, even where that was not the original intent of the web site operator. For instance, a person using the computer later may give his or her name or e-mail address to the agency. It may then be technically easy for the agency to learn the complete history of the browsing previously done by users of that computer, raising privacy concerns even when the agency did not originally know the names of the users. There will be some changes coming to Federal News Radio 1500 AM. We told you last week that Jane Norris, who has been one of the anchors on Federal News Radio 1500 AM for the four years, is moving into private industry joining Deloitte. We got to talk to her about her tenure here. My co-anchor, friend and my “work wife,” Amy Morris, will join the Federal Drive working with Tom Temin… And the afternoon drive program will change — the Daily Debrief will go and, on May 17, it becomes the DorobekINSIDER… on the radio. We are still working on what exactly the DorobekINSIDER radio show will be — and thoughts are more than welcome. The way that I have been describing the show is Charlie Rose, but on caffeine… and/or ‘the federal water cooler — but on the radio.’ The thing I love about PBS’s Charlie Rose Show is that it is almost always thought provoking. It is smart people having a discussion about important issues — and about issues that matter. So we have gone through an exercise of coming up with the words that would describe the DorobekINSIDER on the radio. Among the words I’ve come up with: buzz… news… connected… innovative… thoughtful… helpful… celebrate success… embrace failure… curious… collaborative… information sharing… helpful… fun… 2.0 (or whatever)… assessing conventional wisdom… challenging conventional wisdom… community… and did I mention fun? Well, it is worth mentioning again. One of the remarkable aspects of Federal News Radio 1500 AM is that we are an ongoing evolution — in some ways, I think the station is really an experiment in radio. It is the first radio station in the world (as far as we know) to move from the dot-com world, to a relatively small frequency, to now blasting on one of the biggest AM frequencies in the Mid-Atlantic. And we are using that booming broadcast voice to reach a community — to you. We want to continue to push those boundaries — while always keeping our eye on OUR mission: To help the government operate better. There are a number of questions remaining… for example, I’d love for you to be involved. How do you WANT to be involved? Yet I have always tried to operate in an open and transparent way. We will address those questions here as they arise… and I hope you will help create the show that accomplishes that mission: To help government operate better. As we say in radio… stay tuned.